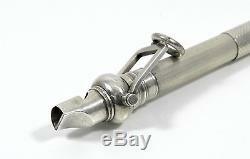 Rare Antique Victorian Novelty Solid Silver Whistle Propelling Pencil, c1880. 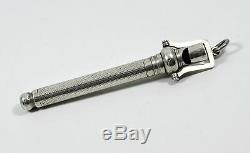 Antique Victorian solid sterling silver novelty propelling pencil with whistle. Cylindrical shaped body with engine turned decoration around the outside & a small vacant cartouche on the side. D is a plain ball shaped tip & at the top is a small whistle with a swivelling suspension loop & ring around the outside. By pulling the pencil body the internal propelling pencil tip extends & retracts telescopically, this mechanism in in excellent working order. 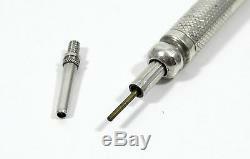 The pencil has a twist action tip which would extend & retract the internal pencil lead mechanism. Unfortunately the internal lead pushing rod although still intact does not extend or retract as it should. The pencil could still be used to write by inserting the correct length lead, it just would not extend or retract. As was very often the case, the pencil is un-marked but has been acid tested to confirm it is solid sterling silver. (This pencil is shown in the KB Collection of Pencils book on page 81). Excellent condition with light surface marks that are consistent with genuine age, use & polishing. There are some very minor dings on the bottom ball end where the pencil has been put down over the years, but you have to look very closely to see them. 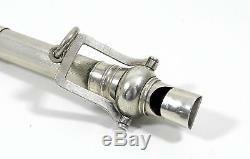 The item "Rare Antique Victorian Novelty Solid Silver Whistle Propelling Pencil, c1880" is in sale since Wednesday, July 19, 2017. 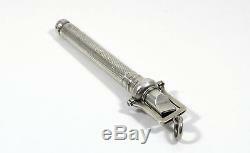 This item is in the category "Collectables\Pens & Writing Equipment\Pencils".lake" and is located in Bristol. This item can be shipped to North, South, or Latin America, all countries in Europe, all countries in continental Asia, Australia.